Cultivating. Trenches aren’t fluffy places to be, but there is nobility not too deep below the mud of the struggle. I have been working as a “coffee writer” (covering craft, commodity, conversation and culture!) for about two years, but before I went down the coffee rabbit hole I worked as a public high school teacher in New York City’s unique District 79. D79 is the city’s Alternative Education district, operating as programmatic rather than geographic, with sites in all five boroughs that pair classroom education with other essential corollary services including hospitals, Rikers Island, drug rehab facilities, and counseling centers. Due to confidentiality I’m not able to disclose excessive details, but I can say that I taught in Brooklyn and the students in my classroom faced a healthy roster of challenges. This July I returned to the same site to teach summer school. The students were new, but the severity of their situations was unchanged from that of the students I’d said goodbye to two years ago. I chose to pursue coffee stories not so much because of coffee but because of the stories. High school classrooms and coffee mountains aren’t that different when you look at both simply as places where people spend time together. Humans are social creatures but we’re unfortunately also rather self-centered and not always the best at asking how other people are doing or listening to the answers. Both crops and classrooms have shown me how to do a better job. No one knows what it’s like for cries to fall on deaf ears better than tropical farmers growing an “orphan” commodity and high school students who face a laundry list of massive obstacles. Part of the job description of an English Language Arts (ELA) teacher is to teach students to write, and writing includes responses to something you’ve read (other people’s writing), something totally invented and fictively imagined, or something you write about your own reality. The remainder of the ELA curriculum involves teaching students to read and listen in order to analyze information and draw conclusions. This summer the case of Sgt. Tahmooressi, the former Marine who drove across the Mexican border with loaded guns in his car, was in the headlines. For a media analysis lesson I had students read/listen to several sources of information and then draft lists of questions they would need answered in order to form a defensible opinion about the case. For homework, I assigned students the prompt below, asking them to connect one undercurrent of the day’s lesson—how a person’s past shapes his/her personality—to their own lives. Student responses appear in italics and all names have been changed. Where were you born? Where have you lived in your life? Describe the place(s) in which you grew up and how they influence who you are today. Think about Sgt. Tahmooressi and how his past experiences in the Marines stayed with him and affected his actions even when he was no longer in combat. How did the way you were raised and the setting of your childhood affect who you are today? 2 paragraphs. I was born in Staten Island hospital. I lived with my mom part of my life back and forth to my grandparents house until my mom passed away. Now I live with my grandparents. Well my mom wasn’t that good of an influence. But my grandpa is a big influence in my life because I can see how strong he is and I get that from him. I learned never give up on how hard life treats you. What affects me today is the memories I have with my mom more likely bad then good. But I mean I can’t just seat down and think about all of this I gotta move on and become the best I can be. So it does affect me but I put it on the back of my mind. I was raised wrong I guess because my mom never took care of me when I lived with her. But now my grandpa does a good job at it. My grandpa came form Canada. He is 71 he’s strong because even though his leg doesn’t work that good he still forces hisself to work and my grandma is sick and he takes care of her like she can’t walk and she has to go get dialasis treatments so he helps her go up and down the stairs. I was born in Brooklyn and raised in The Dominican Republic for 4 years going back and forth from D.R and brooklyn. I grew up around calm/violent areas but mostly good areas. all the traveling from my past made me into the traveler I am today. I was born in Mexico. After we moved to the U.S to have a better life. I don’t remender a think when I was small. I think about Sgt. Tahmooressi and how it must be hard for him when he was at war. I was mostly raised in the U.S and the only person who raised me is my mother I don’t remender alot of stuff, but my mother raised me as hard as she can because she had a job, so mostly when I grow up more and more I started to raised myself because my mom was busy with worked. There is a candid honesty here that rarely accompanies any discussions reported in mass media depictions of the nation’s education system. Sure, some students do whine and lay blame, others are plain lazy, others are mean spirited. Sure, some teachers are tenured for no good reason and some administrators are incompetent. But what I like about these student responses is that they show—in very few words—the reality that when students “fail” (when they approach high school graduation age having missed major chunks of academic instruction) it usually has nothing to do with the functionality or design of structured system and everything to do with nuanced reality that isn’t flashy enough to make headlines but is corrosive enough to crumble a student’s foundation. The struggles these students have grown up with every day of their lives have to do with a confluence of factors creating the complicated individual situations they find themselves in. If we think that there’s a flaw in the system that is responsible for student failure then the reasoning is that, once identified and repaired, the removal of the flaw will improve the system such that there will be less student failures. The much more uncomfortable narrative is that if every individual student “failure” (or inability to realize potential) is the result of entirely unique situations instead of being caused by the same systemic flaw, then the fix becomes much more difficult. If collective student failure (ie, failure befalling a group of students) is not caused by a collective misdesign but is actually the result of a host of diverse calamities all having the gross audacity to happen to a given student at once, then is not a matter of identifying and repairing one flaw in order to improve many outcomes; it is instead a many-fronted battle against numerous and varied causes that each take significant time to understand and to heal. Growing up (“being raised”) is not a pipe that funnels students to success if threaded correctly and leaks unsuccessful students if cracked. Being raised is like hopping from moving platform to moving platform, as an avatar might in some sort of “Legends of the Hidden Temple” wipeout maze. The course is indirect and every step is unfortunately a new chance for things to go awry. It is tempting to believe that we can build an academic system that flows directly to universal success. But that thinking completely corners out Ciara, Henry, and David; they would already be in the puddle under the new pipework. This fall I returned to my post as a teacher in D79 but to a new site with new groups of new students facing new slews of obstacles. It might seem like a departure from coffee, but the daily realities of agriculture and education are actually pretty parallel. It’s nice to think of and talk about “commodity supply chains,” but I spent two years scouring the Latin American mountains for a chain with discrete links that hooked one to the next to the next, and I found nothing of the sort. I found many overlaps and underhands and crossovers and sidesteps; I found new ways of accomplishing the same goal every time I rounded the shadowy side of a mountain. 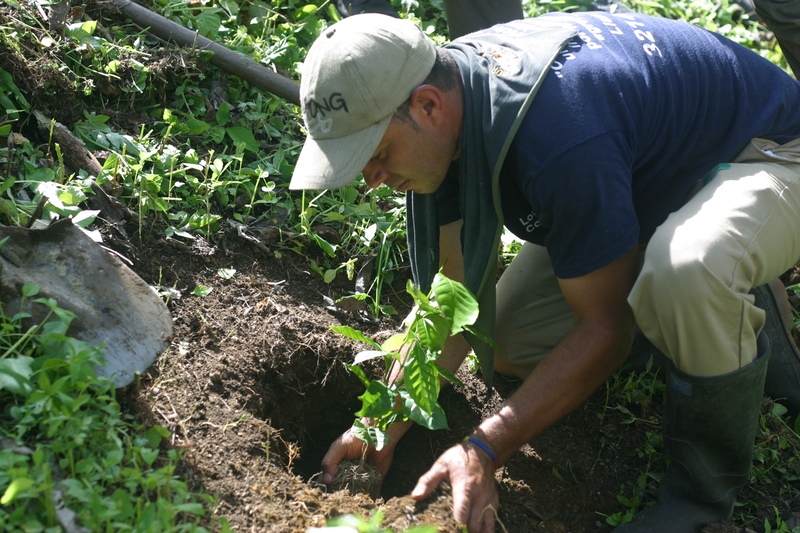 Coffee production is as individualized as education should be. Every farm has a different climate, different soil, and is cultivated differently. Every student has a different history leading him/her to the classroom desk. Students’ “academic successes” are “successes” in the plural and need to be cultivated individually. This work is not easy and effort is not always rewarded with results. There are some information-based professions where data can make perfect, ordered sense if you arrange it properly. In agricultural pursuits you can’t control the weather, nor can you control how many other people are growing the same thing or how much people want the thing you’re growing. In the pursuit of education you can’t control the gauntlet of outside challenges students have to contend with. You can work to influence, but you can’t control. Farmers and teachers know how to field variables beyond their control; people who like to wield complete control probably don’t become farmers or teachers. I sometimes think it might be nice to have a job that were more neat and predictable, but there is something unapologetically straightforward about plants and teenagers; both are shamelessly dead giveaways of the soil in which they are sown. That tangible straightforwardness, which couldn’t be more clearly illustrated than in the student responses above, is what drew me to both trees and kids in the first place. There is no manipulation of data that will bring back Ciara’s mom or let David’s mother work less hours. There is no formula for resurrecting plants stripped by leaf rust or flattened by hail. But, in both cases, in the muddy trenches of the mountaintops and the chalky trenches of the classroom, we can fertilize, we can prune, and we can continue to cultivate. Schools don’t have to look like blighted fields; mountainsides don’t have to feel like neglected urban hallways. Like trees, people grow and transform and recuperate enough strength to change shape and bear the fruits of success, in all its juicy caffeinated and academic flavors.